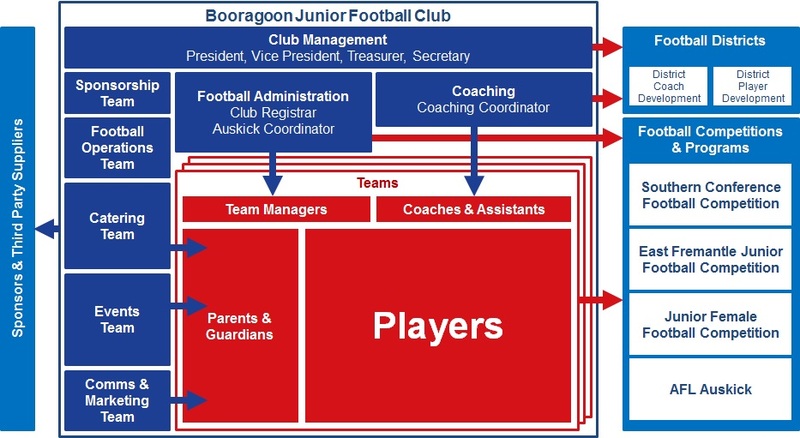 The operating structure of the Booragoon Junior Football Club, depicted below, shows what the key functions within the club are and how they engage internally and externally. The major functions are described below. All Booragoon JFC Committee members are expected to take an active role in one or more of the following functions, preferably as part of a small team for some of the larger functions (Catering, Events, Football Operations). Detailed job descriptions for these positions can be found at the WA Football web site. Schedule, plan and coordinate events – sundowners, social events, fairest & best evenings, club wind-ups, etc. Note that Players, Parents, Coaches and other Officials are bound by the various Codes-of-Conduct of Junior Football. Manage roster of parents required to contribute to club operations activities – canteen, etc. Get involved in game-day duties (runners, water carriers, first-aid, set-up, pack-away, etc).